Originally we planned the first public course CSPO - Certified Scrum Product Owner on February 1-2, 2016 in Prague to be in Czech. However as we have orders from the only English - speaking Product Owners we decided that course will be in English again. The trainer is Zuzana Sochova, CST. We have still few seat available and so far you can get early bird discount - if you register until January 1, 2016. 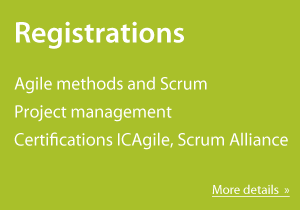 Details about this certified workshop can be found at scrumalliance website.